Photo 1: Tamika, Balaji, Donovan, and Josh posed at Victoria Falls, located in Zimbabwe just south of Zambia. Photo 3: Scott, Lauren, Balaji, and Donovan stood on the community’s water tower to perform preliminary testing of the network booster system. The team needed to test the system to locate the directionality of the strongest signal. The team utilized sustainable sources of power for use in the active booster system by also installing a solar panel to supply energy. Photo 4: This depicts an educational session held with community members to transfer essential knowledge about the Biosand water filtration system. The team focused on providing information about the construction of the filters along with information on personal hygiene. Photo 5: Community members help collect rocks for use in the water filters built for testing water quality. We must ensure the design provides high water quality before replicating it throughout the community for everyday use. Travel Prep, Gear Up, and Take Off! During the past few months at Boston University, the streets that were bustling and full of action during the final weeks of the semester were tuned down as the summer atmosphere settled in. However, the pleasing environment is a great time for our organization to get even more work done as we have finalized preparations for our trip to Naluja, Zambia! Our travel teams and students are very excited for the upcoming trip and have been through weeks of preparation to achieve our goals in Zambia. The trip will take place August 10th – 27th, giving us much time to spend with our partner community and accomplish goals for the three projects we are currently working on. Our partner community is a small village in a rural region located in the Kalomo District of Zambia’s Southern Province. The population is approximately 15,000 and centered around the community’s only health clinic. This will be our second trip to Naluja, following last summer’s assessment trip and first encounter with the people of the community. Having progressed on our three projects throughout the year, we anticipate the trip to improve the community’s health conditions and continue our mutual goal for development. Our focus will be implementing the Cell Phone Signal Amplification project, using a double Yagi-Yagi system. We have fine-tuned the model of the project in order to get the best possible boost in cell signal, while ensuring simple construction, minimum maintenance, and sustainability. We also hope this will bring support to CGHD’s (Center for Global Health & Development) and ZCHARD’s (Zambia Center for Applied Health and Research Development) text-messaging system that looks to improve the communication of medical blood-tests that scan for HIV in infants. Expediting the transmission of results from the medical centers in the nearby cities to the remote the village is essential to tend to the health needs of the infants at their most precarious stage of life. Also, amplifying signals will promote greater intra-community communication and greater outreach outside of the village. This trip will also serve as an assessment for our two remaining projects – water filtration and power generation. The assessment phase of these projects is crucial to acquire information from the environment and data from the clinic in order to weigh the feasibility of designs we will start prototyping this coming fall. Furthermore, another goal of this trip is to strengthen our ties with the community and local partners in order to move forward towards accomplishing more in the next few years. Having a close contact with our partners will help us gain a better understanding of what they need to improve community health and what they would like to improve in their village. We hope to gain more information to think of future projects that will further community development. The travel team that will embark on this exciting journey is composed of two Boston University students and two mentors from the EWB-Boston professionals network. The two students – Nathanael Lee and Dan Sade – make up a well-rounded and motivated group that have the determination and skills needed to take on such an experience. Furthermore, the two mentors – Mohammed Jafri and Hunter Chaconas – will bring their professional expertise in ensuring that implementation and assessments are done properly. We are fortunate to have Mr. Jafri return to our travel team for the second year, as he will oversee both the Cell Signal Amplification and Power Generation projects. Mr. Chaconas, our newest mentor, has been working close with students in the water filtration group as he plans to oversee that aspect of the trip. All students and mentors will work closely and in a collaborative manner to accomplish our goals on this trip. Nathanael is a rising junior in BME and is a returning member from last year’s travel team. Going for the second time will give him a unique perspective as he will be able to witness the progress between the previous trip and the upcoming one. He has been involved in much of the travel preparations, prototyping of projects, and lead of power-generator project. His experience from the previous trip will bring great insight as the other students make their first encounter with the locals of Naluja. Travel team and other EWB members prototyping our Yagi Antenna! Preparations: Over the course of the past few months we have been busy preparing for impending lift off to Zambia, a journey that takes over a day to reach our final destination. The summer calm has given us time to coordinate with our local partners, prepare equipment for building, plan logistics, and complete other travel preparations such as renting camping gear from the BU Outdoor Club and filling paperwork for international travel. A few weeks ago, the travel team and other members of our chapter met for a comprehensive tech-day that involved prototyping and presentations of all three of our projects. The culmination to our trip has been the product of a close collaborative effort between our partners in Zambia, executive team, general members, travelers, mentors, partners in Boston, and Boston University departments – College of Engineering and CGHD. We are fortunate to have the support and opportunity to return to Naluja in order to continue our progress towards improved community health. It brings us much joy and motivation to embark on this journey as we look to accomplish our goals and set new ones for the coming academic year! Best of luck to our travel team! To our great delight, we have a long list of devoted students who are continuously involved in our chapter at Boston University. At the beginning of every year, students express much interest in participating in our mission to raise awareness for global development. Furthermore, they are always excited to join our technical groups by helping prototype projects that will help move towards our implementation goals in Zambia. Interestingly, the holistic EWB process is sometimes overlooked when students join our group in the middle of a program, as the one in Naluja. For our members and partners, we believe that it helps to have an understanding of each step of the process in order to move towards our yearly goals. The article below will outline the major steps involved from the conception (start) to culmination (closure) of a program and describe our current place in the process. We hope that such an overview of the program cycle will help give you a better understanding of the steps that were needed to achieve our present state and our vision as we move towards our goals. EWB emphasizes a community-driven approach to development, in which the community-in-need must be well structured and have a thorough understanding of their needs. EWB’s review committee grants program approval to a community only after a thorough analysis of its drive for improvement, local partnerships, and community agreement if accepted. After an EWB-chapter applies to adopt a community program, the two partners start a close relationship that will strive for many years after the program’s inauguration. At this point, the EWB-USA chapter has engaged in a commitment that will last a minimum of five years, giving much time for setting and accomplishing precise goals for community development and increased health. As you may know, our chapter started a partnership with the community in Naluja, Zambia just a few years ago. This phase of the process usually occurs between three months and one year from the time when a partnership has been established and approved between the EWB-chapter and community. This phase includes thorough research of the many different factors related to our community. There is first an investigation of the community’s geological landscape, available resources, cultural adherences, and the people’s most dire community needs. Through much cooperation and communication with community authority and surrounding NGO partners, we establish goals to assess the community’s needs. A comprehensive community assessment is made by a first assessment trip. This is an exciting time to meet, in person, our partners in their local village, while gathering much needed information on which projects we will be researching and propose engineering solutions that will address the community’s problems. It is also for strengthening collaborative ties and partnerships with our partners. During the summer of 2012, our EWB chapter at BU sent three students and a mentor on its first assessment trip, gathering much information to work towards implementing the cell signal amplification project. The assessment phase of a program is also a time during which projects are researched and prototyped until the most sustainable, economically manageable, and efficient project is proposed to the community to resolve one or more of their community issues. Our chapter is currently in this phase of the process for two additional projects in the program in Zambia – water sanitation and power generation. The crossover to this phase of the process is achieved when a final design is proposed and approved for implementation in the community. This can only be done after a thorough analysis of the project’s sustainability, a certitude that the project will be accepted and wanted by the community, and that detailed plans are made for on-site implementation. There is much preparation involved in making sure that any foreseeable obstacles will be addressed and that all measures are taken when the project is installed, in order to ensure its successful use by community members. There are multiple aims to an implementation trip, which our chapter will be conducting this coming August. The first is to successfully implement a project and ensure that it functions properly, fulfilling the community’s need. Another important goal is the dissipation of information by giving community members tutorials on how to build, fix, and monitor devices that are implemented. This also involves the preparation of a project manual and education material that will emphasize the importance of acquiring knowledge about the problems the people face and projects that are implemented. It gives an opportunity for community members to realize the importance of implementing change to improve overall health and teaches them the skills necessary to build more such models of the project for personal use. In conjunction to the implementation trip, our chapter will also gather information as part of an assessment trip for the water and power projects, as mentioned above. After a project has been successfully implemented in a community, there is a monitoring period of several years during which a close collaboration is maintained with the community in order to ensure that all projects are functioning properly and optimally. Once a project has reached this phase, it can also be a time to implement more projects to improve other aspects of the community’s health. In all cases, the EWB-chapter still continues to monitor all of the projects’ progress. Our chapter is moving fast and on track to reaching this phase for at least one project in the near future. This will certainly be a moment of reflection as we will look back at our hard work and hopefully celebrate improved health with many of our friends in Naluja. We will be able to learn from our experiences, improve our tactics, and look forward to more ways of helping our partners by engaging in the efforts for global development. This is an overview of the EWB cycle, without getting too entwined with the plethora of paperwork needed at each stage of the process. It brings much joy and hope for global health when our year’s goals are successfully reached in our partner community in Zambia. However, taking a step back enables a more holistic vision of all the accomplishments that have been reached so far and the steps that lie ahead of us in the process. As the academic year comes to an end, it is always a time of personal reflection and mixed emotions. 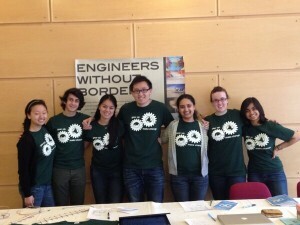 The Engineers Without Borders chapter at BU works holistically as a group, combining the efforts of all its members to reach the year’s goals. Indeed, each year the organization is headed by an executive board that guides the body towards actualizing the visions we have. They work consistently with both students and partners to accomplish as much as possible in the span of just two semesters. However, as a new academic year waits, the E-Board transitions to a new group of students that will be indispensible to move towards our long-term goals in Naluja and beyond. As the current E-board seamlessly transfers its wisdom to the new executive board during the transition phase, we are very thankful for their work this past year. Their efforts and passion for EWB is expressed with much excitement every time they advocate EWB and other global development initiatives. By virtue, they became role models for all members and were a defining part in making the program in Naluja a success thus far. This is also a time to assess what the next goals will be, starting with our first implementation trip this summer, and further objectives that will help reach the same vision – providing sustainable solutions for global development and community health. I’m honored to lead EWB-BU and am very excited for the year we have ahead. As our projects begin to get off the ground, we will need the various skills that all group members and partners provide to ensure our goals are met. I believe we are capable of making a concrete difference in Naluja and am greatly looking forward to working with all our members and our new E-Board. Future sustainable technologies and the development of global health systems is in our hands, ALL OF OURS; engineers and non-engineers alike! I wish to join hands with public health workers, BU faculty, and the general student population to show people how they can help us take our next steps. Everyone has something to offer and a few more links in our organization could turn a few ideas into great progress this year. As a member of the E-board, I am looking forward to finding a more dependable financial source next year. Our project needs a somewhat continuous funding source to truly meet the goals we want to reach. I am also excited about planning the fundraising events on campus not only because they are fun but also because they are great way to get the whole EWB team involved and raise awareness around BU. I am very excited about this upcoming year, and I will work hard to be a good treasurer! Feel free to talk to me about anything! I am looking forward to meeting new members! 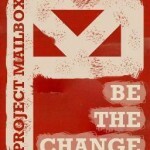 Project Mailbox – Change for Change! We are very pleased to be Project Mailbox’s partner for the second time since their organization was formed! This is a “charity for other charities”, helping raise awareness and funds for other non-profit organizations. We have been selected as Project Mailbox’s March Charity of the Month, which involves an international organization that promotes aid and humanitarian help in other parts of the world. This is an ideal fit for us as we continue to work towards our next trip to Naluja, Zambia in order to implement our first project – the cell phone signal amplification antenna, as well as gather information for future projects. This is a wonderful fundraiser for you to participate in to help us reach our goals of returning to Zambia and to take a part in making global development a success. The Project Mailbox runs through the entire month of March! So, any change (coins), cash, or other sources of funds that may help us towards our trip will be given directly to EWB-BU to spend on our projects in Zambia. Any such funds are much appreciated and will certainly be used efficiently to help thousands in the Naluja community. We all have change cast off in corners of our rooms, so instead of letting it accumulate dust – bring it to the Mailbox! Actually, any form of funds can be simply dropped off in the mailbox on your way back from class or when going out. 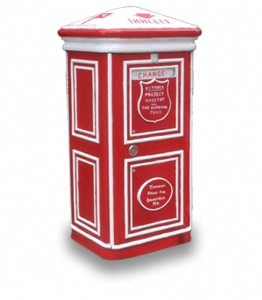 The mailbox has distinct red and white colors placed near Warren Towers, right outside of University Grill at 712 Commonwealth Avenue. Any amount of change can accumulate to make a big impact and enable us all to “make change” in our goal for global health and development.